Some of you may have read that title and envisioned one of the worst adult entertainment video series ever. But the rest of you know exactly what that title is all about. A 3-2 game between two Scudetto contenders in Serie A yesterday that was decided by a ref. Signor Rocchi, to be exact, whom Milan know very well. So today’s rant will be about what happens in games with refs gone wild. Maybe Rocchi prefers Itzhak Perlman? To start with, you should know that I’m honestly a big fan of referees. So much so that I’ve taken some trainings and wielded flags and whistles at an amateur level, actually. Until I realized that I was not fit for the job, and left it to others who at least thought they were more able, as some of Lega Serie A’s finest should also do. And I’ve even written about unorthodox methods that could be used in the future by referees if current trends continue. But I’ve also written a lot about referees' decisions, and always tried to write as fairly as possible about decisions that impacted Milan’s games. For example, in the 2012-2013 season started horribly for Milan. But beginning in November, Milan made a sharp turnaround and results changed dramatically. There was much discussion about why, and I outlined my reasons, which included a lot of “luck” with referee calls. Usually, ref calls even out, they say. But that season, we were more than blessed. Poor Fiorentina fans know all about poor ref calls for Milan, as that same season, they faced us in what would become “The Legend of Tagliavento,” a game where football was secondary to some alternate reality the man in yellow was experiencing. And they saw us take their Champions League qualification spot that season, too, with a decisive penalty call for Milan in our last match vs. Siena. Not how it should be. Paolo "I never let a card go to waste" Tagliavento: Legend. But the two teams who played yesterday also have a history of refs gone wild with Milan. 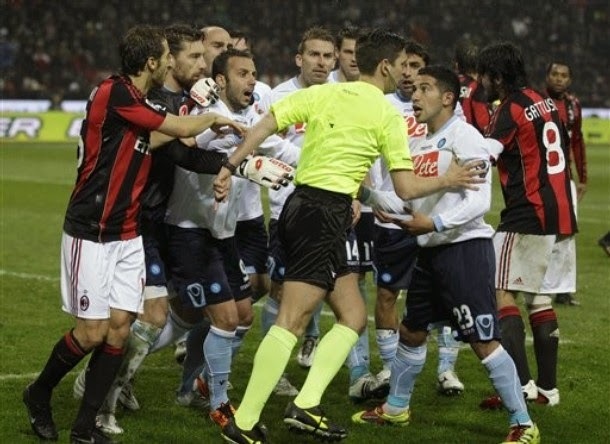 In fact, Rocchi reffed our wild end of the year mixed martial arts match with Roma in 2013, complete with laser pointers, racist chants, and Rocchi being accosted by Sulley “The Killer” Muntari. And again just six months later as his decisions were poor when we met them last December, even if I don’t think he necessarily decided that match. Still, a good ref is never the talking point after a match. And Rocchi has rarely ever been accused of being a good ref. Juventus and Milan also have plenty of history with refs in recent years, but perhaps none so notorious as Tagliavento and his team (including Rocchi as the fourth official) in February of 2012 with the “Gol di Muntari” that was infamously not awarded to Milan. Yesterday, Juventus were again the beneficiaries of the ref calls, which only increases the acrimony in such a tight title race, and in the end football loses. In fact, no one wins. Suspicions raise more because of Juventus’ success than anything else, but the suspicious look to illicit accusations when favorable calls are awarded to decide a match. I have said that Rocchi should win an unpaid vacation for his part in yesterday’s episode of Refs Gone Wild, but it has actually happened to him at least once before. In fact, back in December of 2011, his decisions wrongfully gave us a draw with Bologna, and he was subsequently suspended for two weeks, if I'm not mistaken. This is the very least he deserves after being the unwitting focal point of yesterday’s match. Because it wasn’t just the big calls he got wrong, he never controlled the match, one of the most important jobs of a referee that often gets overlooked because of the decisions which impact the stat sheet. And it wouldn’t be the first time the game has gotten out of control when Rocchi is in charge. 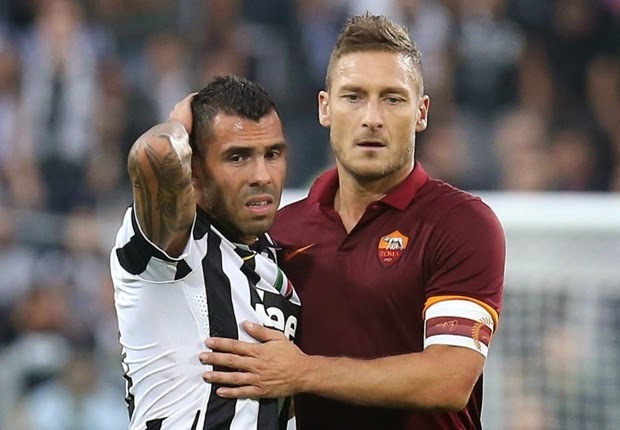 Now there is a renewed sense of acrimony between the two clubs who faced off in Torino yesterday. 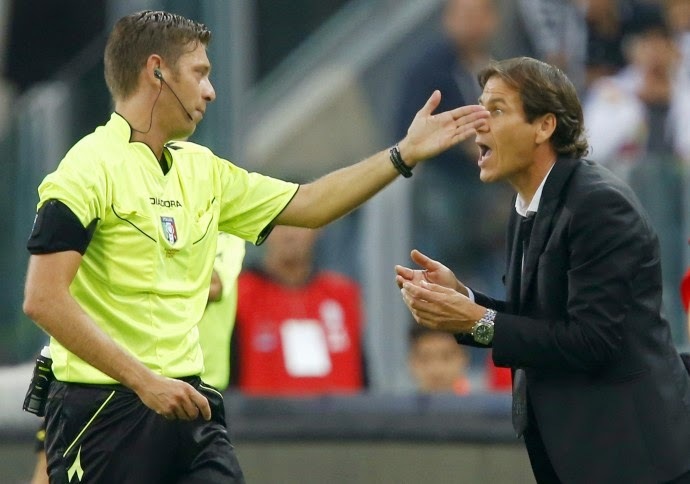 Garcia, sent off for his sarcastic air violin efforts (does Rocchi hate the arts or something?) is normally all class, but he couldn’t help but speak out about the refs. Totti, more known for saying whatever pops into that not-exactly-known-for-his-keen-intellect head of his, was even more outspoken about the decisions. While I don’t usually condone speaking out about the refs, it’s hard to say we wouldn’t do the same in their position. Roma were done an injustice. And while Garcia fairly pointed out that they had chances to win but didn’t do it on their own, Juve were given 2 penalties, Roma only one. The deficit in the final score was due to Rocchi, not Iturbe or Bonucci or any of the other players. Roma lost and football lost. And how is Allegri coming out looking the classiest in all of this? Breaking up the fight between Morata and Manolas because neither Rocchi or his 4th official could manage to get there fast enough. And then admitting that Vidal wrongfully blocked Skorupski’s line of vision on Bonucci’s “gamewinning” goal? (See, he also criticized the refs, but not directly.) He seems to have a short term memory about him getting angry with the refs, though, he was sent off more than once at Milan for yelling at refs and getting in their faces. But he’s got to be grateful to be on the winning side of a Juve controversy this time. Just don’t confuse that with being classy. "Please make the man with the cards stop." "He's given you 2 penalties so far, you're gonna be okay"
Even worse than the renewed acrimony between the two clubs is the fallout between two groups of fans who consistently vie for the title of worst behaved and/or most fined fans in Serie A. Juve fans gloating over the win that was not even necessarily won on merit. With any other ref, it could have easily been a draw or possibly even a loss. And Roma fans, who throw out claims of cheating, ref bribing and Calciopoli, none of which are true. Further distracting and dividing fans from the game, especially ahead of an international break when calcio fans should be uniting for a common cause. And all of this because of a little man with a whistle decided a game instead of letting the players do so. Serie A is back in the spotlight with two fresh black eyes and more outside interest in off the pitch issues instead of the beautiful game itself. 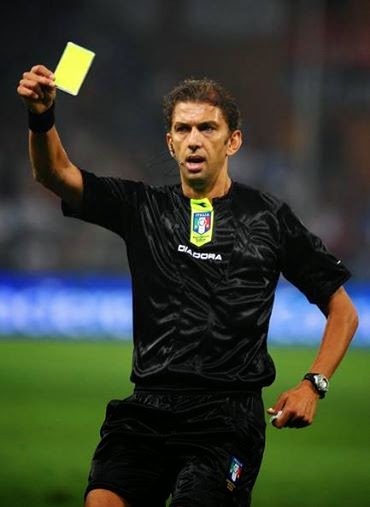 Rocchi’s stats yesterday included seven yellow cards, two red cards, three penalties awarded, and a coach sent off. Oh, and one yellow that he almost showed as a red, the sign of a truly gifted ref. And that doesn't even begin to encompass his performance. But his impact on this match will reach much, much farther than just those numbers. So much needs to be changed in Serie A, and I echo others’ sentiments that all of Italian calcio needs a tremendous overhaul. But while refs like Rocchi are still given big games like this one, it might be better just to create that awful series of videos. Because all of calcio suffers when there are Refs Gone Wild.